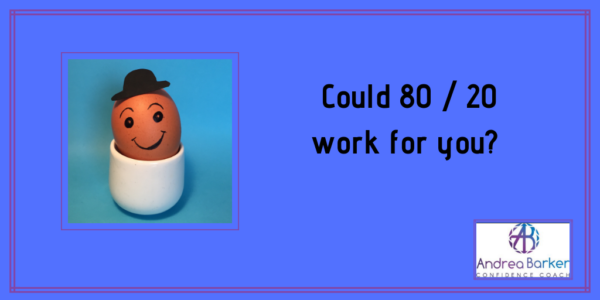 Could 80 / 20 work for you? and help you take the pressure off yourself, in order to perform better and be more productive, and ultimately feel happier. Around this time of year, some people can feel they have let themselves or others down, by not achieving the goal of a New Year’s resolution. The 80 / 20 rule in this instance, that I personally use, is a different way of looking at things, to help you achieve what you want in a kinder way for You, and that’s personal to you too. There is so much information out there about what we should be doing, need to do, how and when, how to set goals to achieve and be successful – succeed. 80% of the time, do what you know you should, for You (we are all different) and 20% of the time – give yourself a break, and do what you enjoy, like and Love. There are a few reasons this could work for you. By being kinder to yourself in this way, you relive pressure and stress and are more likely to achieve goals you may have set, empowering you to succeed and achieve – feeling much more motivated and happier, and not beating yourself up along the way, and feeling like a failure. Setting goals can be positive and great way of helping you to focus and plan. To reach deadlines, and get things done. If the goals just seem like a never ending ‘to do’ list then the pressure can really ramp up, leading to overwhelm, and feeling like you can’t prioritise, because you have lost sight in the mountain of things to be achieved, and the expectations set by yourself and others, which can lead to making mistakes, and also stifling your ability to be solution focused, and like you are not moving forward at all. In order for goal setting to work, the goal needs to be realistic and achievable – for you. That you have planned how you are going to get there and have the correct resources and support crucial to your success. It is also important that the goal set is for YOU, and is what You want, that there is something in it for You, because if you haven’t really bought into it, and WHY you are doing it, then with the best will in the world, you will find it a hard thing to do. Other considerations for goal setting is not to set HIGH achieving goals that feels too out of reach, and unobtainable, without first breaking them down into smaller achievable chunks. If you don’t it can lead to either feeling like you’ve ‘failed’ before barely starting, or leads to Procrastination and complete avoidance, to avoid the inevitable ‘fail’. It’s not saying don’t have big dreams of what you want to achieve but do think around the planning – climbing Everest is not done in one go, there is a lot of preparation, and the peak is reached step by step by step, as is the descent. Having a plan beyond the ‘goal’ is also something that can be crucial too, to either help you maintain what you have achieved, or some reward to allow yourself to revel in and enjoy your achievement, before possibly moving on to the next thing, and the next thing. Where the 80 / 20 rule really comes into its own is about alleviating the stress around eliminating and denying yourself things, which can create resistance to the very thing you are trying to achieve. ‘Thou shalt not have’ ‘you will not’ ‘NO’ and the ‘loss of’ creates an interesting state in most humans! It causes craving of the very thing you’re trying to cut out, stress and pressure, and also a state of panic sometimes. We can then move into defiance and / or ‘survival mode’ because we don’t like to feel we are losing something – even if it is good for us! and it can make us feel unhappy too. Why? because of the ‘fear of change’ the unknown, the ‘what if’s’ and the ‘who will I be if I’m not this?’ ‘what will I do if I don’t do this’ and also not having really bought into the ‘WHY am I doing this?’ – at a deep level, that really means something to you. So, using 80 / 20 can really help, because if you are ‘doing what you know you should’ for 80% of the time, and 20% of the time you can have ‘time-out’ this instantly helps you reduce the pressure and stress on yourself, and so long as you have planned HOW you are going to achieve your goal, then you’re on to a winner, because there is no denying anything, no need to panic and a much more enjoyable experience, and then as you achieve the results you want – guess what?! Motivation and momentum build, and you no longer feel like you’re fighting an up-hill battle to achieve your goals. Make sure you are scheduling in your 20% R n R or time out and be truly present when you do, otherwise what are you working for! Real rest has enormous benefits and allowing yourself the time to come up with solutions, and even do a bit of daydreaming – Einstein knew the benefits of this. You can do a rough 80 / 20 split and for example, when it comes to cutting out certain foods, that a lot of people can struggle with, ‘not on a school night’ could work for you. For instance; no crisps and chocolate on a ‘school day’ Sunday through to Thursday (this does rely on having healthier, more sustaining choices available in your planning, which also improve your cognitive ability) and then Friday & Saturday you can have what you want. Do remember you are human though, and there are days where you just don’t feel the full ticket, so do be kind to yourself on those days, and then adjust, so maybe Friday is now out, because you defaulted on Tuesday, and it’s OK.